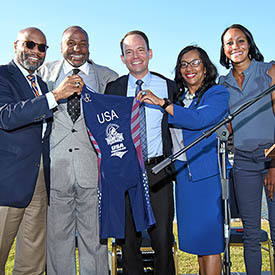 COLORADO SPRINGS, Colo. — USA Triathlon, along with Hampton University President Dr. William R. Harvey and Director of Athletics Eugene Marshall, Jr., today announced that Hampton University will introduce women’s triathlon as a varsity sport starting in the fall of 2019. The school, located in Hampton, Virginia, is the first-ever HBCU (Historically Black Colleges and Universities) to participate in the sport at the varsity level. The addition of the Hampton women’s triathlon program is made possible through a $225,000 grant from the USA Triathlon Foundation, which was reserved for the first HBCU that added the sport at the varsity level in a proactive effort to increase diversity in collegiate triathlon. The grant will be distributed over a five-year period and may support travel, equipment, coaching, scholarships and other expenses related to building a sustainable varsity program. These initiatives are part of USA Triathlon’s larger mission to increase diversity in triathlon. The organization has been recognized by the U.S. Olympic Committee for two consecutive years for its diversity and inclusion efforts, receiving the USOC’s Advancing Diversity & Inclusion Award in 2017 and the Diversity & Inclusion Choice Award in 2018. Women’s collegiate triathlon is a fall sport. The varsity season, which is comprised of three regional qualifiers and the Women’s Collegiate Triathlon National Championship, features sprint-distance races covering a 750-meter open water swim, draft-legal 20-kilometer bike and 5-kilometer run.